The first restaurant we ate at the very first time we visited St Joseph was Schu's on Pleasant Street at Lake Blvd (August 2007). Why Schu's? It was the obvious choice. It was right there across the street from Lake Bluff Park with a perfect view of Silver Beach and Lake Michigan. We were there on a hot summer day and the cool air conditioned air provided welcomed relief. I can still remember looking out at the scenery and thinking what a lovely city St Joseph was. I also remember the binoculars we used (provided by Schu's) to look for boats on the lake. But the food was memorable too... especially desert! D and I shared a "Summerberry Stack" that was out of this world. It was described as, "Bright berries strewn across citrus-flecked cake aswirl with cool tart key lime and creamy white chocolate cheese. So cool, times two, on a butter crunch layered with vibrant raspberry. A look that plays across the seasons." Great description, even better taste! Boy oh boy am I hoping they'll feature this luscious desert again this year! 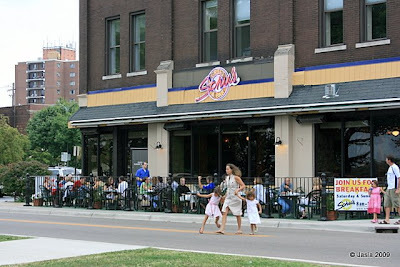 Just last week we had dinner at Schu's on Friday evening before going to the concert at the band shell. I had the Salmon Roma, served with fresh asparagus and garlic mashed potatoes, and it was outstanding! D had a steak and was equally as pleased with his dinner. The wait staff has always been friendly and when I've had occasion to speak with the chef/manager, he was equally as friendly. This is an establishment that strives to make their customers happy.